The FlowTHRU™ integrated threshold drainage solution is designed to offer a practical solution for applications where a flush sill threshold is required. It is the only fully tested threshold drain compatible with AWS systems. Flush thresholds are increasingly popular in a wide range of commercial and residential building projects offering benefits of accessibility, a seamless transition between internal and external environments and a clean aesthetic. "seamless transition between internal and external environments and a clean aesthetic"
Drainage is a critical element with this type of installation, as the water performance of sliding, hinged and bi-fold door systems is impacted when a flush sill is used. 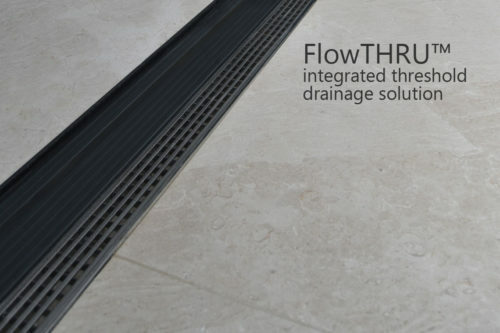 The FlowTHRU™ integrated threshold drainage solution addresses these issues allowing the doors to drain into a recessed stainless steel trough and catering for water runoff from the door panels. This ensures there is no water seepage around the sill and minimises the risk of internal floor surfaces becoming wet, protecting carpet, timber and other internal floor finishes. The correct specification and detailing of flush thresholds is critical to ensuring compliance with the National Construction Code, Waterproofing Standards, Accessibility and Slip resistance Guidelines. It's an architecturally styled stainless steel grate featuring ACO™ Heelsafe®Anti-Slip surface which complies with AS 4586 for slip resistance.